Well it’s been a while. I had such great plans for all the things I wanted to make over the winter months but somewhere along the way I lost a substantial part of my SewJo. The main problem’s been the lack of light. By the time I’ve managed to sit down to sew it’s been dark outside and although strategically placed lamps are helpful they’re no substitute for natural daylight. I’ve still been pottering away on a few easy projects but again the lack of light seems to have thwarted getting out and taking blog photos. Hopefully the worst is over, the nights are getting lighter and its March on Wednesday. The promise of Spring seems to have woken my hibernating SewJo and I’m looking forward to warmer days and some serious time with my machine. I bought the pattern as soon as it was released (around November?) It seemed like a good loose fitting dress to layer up over a long sleeved tee and under a cardigan, it also had really big pockets. I was a little unsure about the hi lo hem but decided to just go with it. I used a medium weight grey/blue Chambray from my stash. It had a little more body than most of the suggested fabrics but I was going for the utilitarian look. OK, so here’s the problem, I made it so long ago that I can’t remember much about it. The sizing goes from 0 (32-25-35) to an 18 (44-37-47) I cut a 14 which is my usual Grainline size (one size smaller than my measurements suggest) and I shortened it by 3 inches. I don’t remember any problems along the way, it was quick and straightforward to sew. 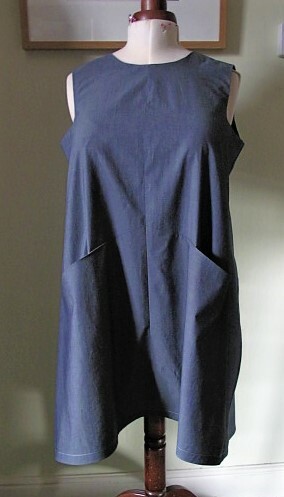 The neckline and armholes are finished with facings. Although they are tacked to the shoulder and side seams they do have a tendency to flap out. It might be an idea to draft an all in one facing or even better line the whole dress. 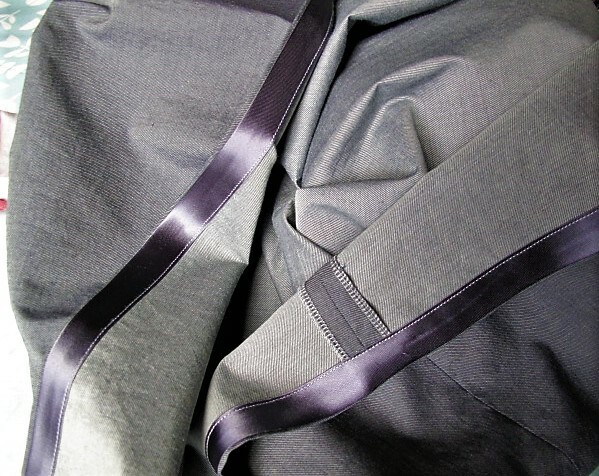 As the back hem of the dress is visible due to it being lower than the front I bound the hem with satin bias binding so it looks neat and tidy if ever it gets flashed. The dress turned out just as I’d imagined. The fit is fine (the only crucial part is the shoulders and bust) but I could maybe do with just a tad more room across the bust. Looking at the recommended fabrics I think it would work better with a lighter fabric and a bit more drape. One of the sample garments was made up in a Liberty tana lawn and as I have ‘the odd bit’ of it in my stash I might try that next. 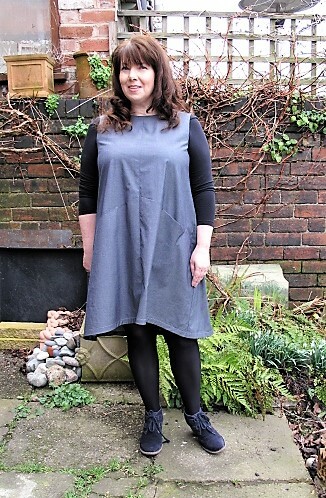 I’ll also try the sleeved version which will get rid of the flappy armhole facings and maybe straighten out the hem, I’m really not convinced about this hi-lo thing. 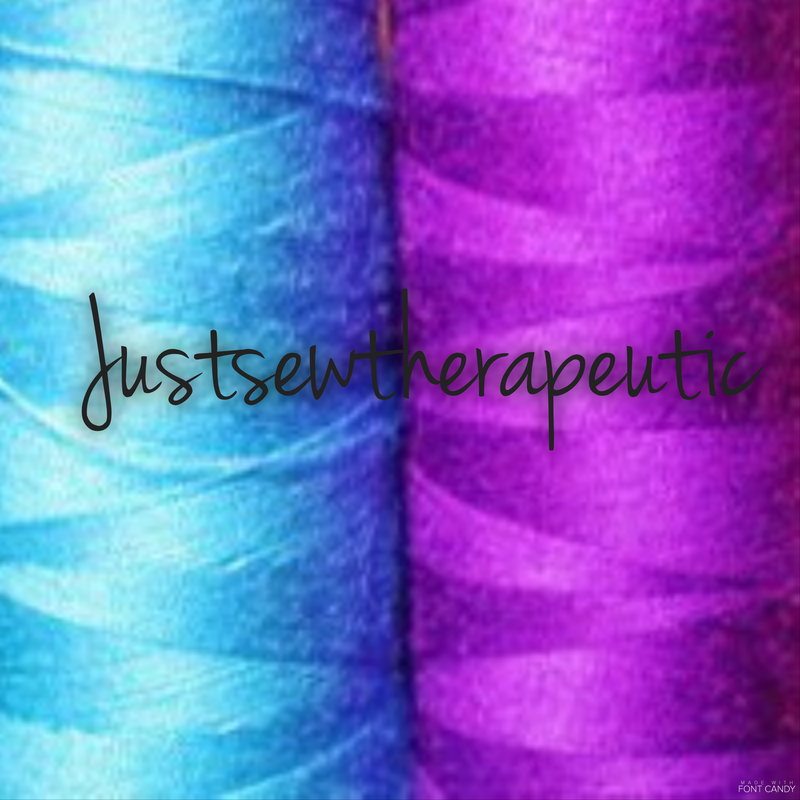 Anyone else out there started sewing for Spring? 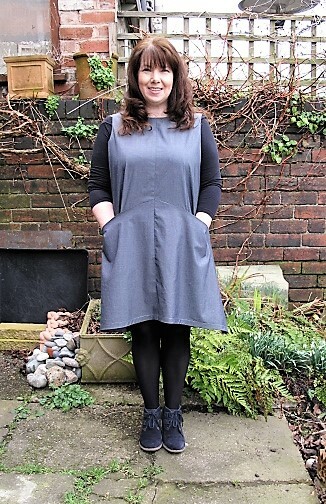 This entry was posted in Finished Sewing Projects and tagged farrow dress, grainline farrow. Bookmark the permalink. This looks really great. I have plans to make this in a heavyish viscose print – lots of drape definitely! I think we have matching boots too! I like the sound of that. I think I chose the Chambray to show the seamlines but I’m drawn to a ‘drapey’ print for the next one. The boots are Clarks Carletta Lyons, I have them in tan too. I’ve worn the navy ones so much I’m contemplating buying another pair for when the original ones wear out! I waited ages and finally got the black Carletta boots in the sales! 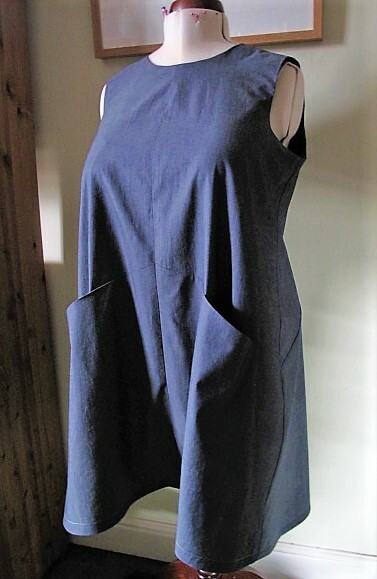 This is a lovely dress, looks really good in chambray with a top underneath. I made it in rayon to get more drape and to be cooler for hot weather with short sleeves. 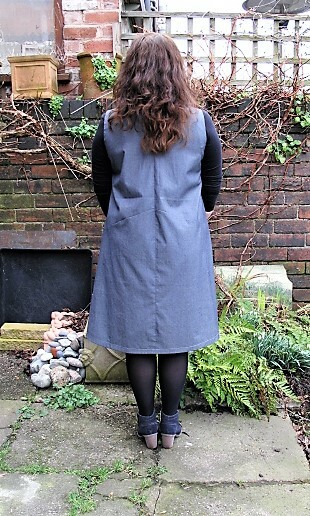 I’m not sure about the hi lo hem (on me), I may have to straighten it up… It’s a beautiful pattern, and amazing pockets. 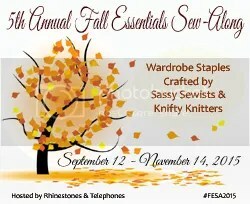 I hadn’t thought of making a short sleeved one, that sounds like a good idea for Spring. I’ll definitely go for more drape next time! 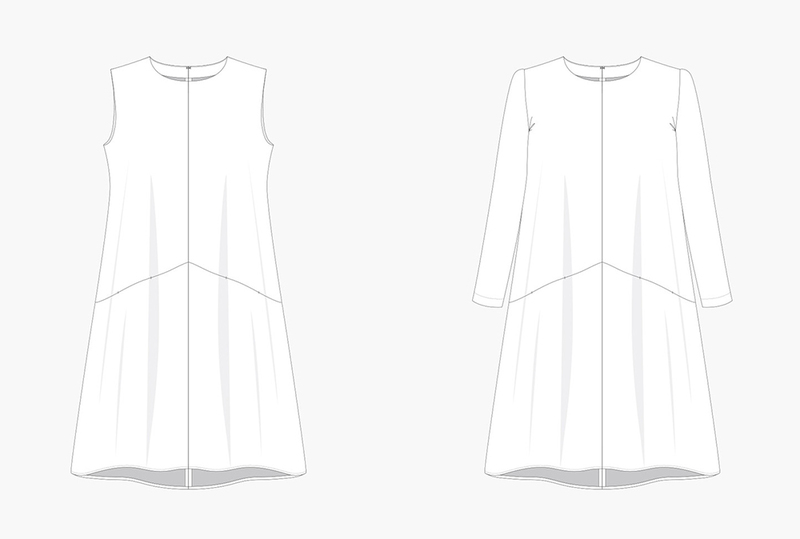 I really love the pockets on this dress and I’m a real fan of bias finished hems – yours looks beautiful. Like you, I’m not entirely sure about the hi lo business – I always worry that people will think I’ve got a wonky hem! I feel the same about hi Lo hems, the front is always a lot higher to accommodate my bust anyway! I think I’ll have to lengthen the front quite a bit and then straighten it out once it’s finished. What a great job you made of it! It looks lovely on you! 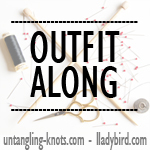 I’m not dressmaking at the moment I’m missing my studio! Thank you! I’m glad I’ve got my Sewjo back finally, I was getting worried it had disappeared for good! Sometimes it is good to take a break now and then 😉 you come back with more enthusiasm! Love the dress and also your hair looks so lovely in the photos, very glam! Thank you Michelle, I was having a rare good hair day!